I put together a new header, added a few new pages at the top, and made the text a little easier to read, added some social media icons that I designed, moved the search bar up (still working on the layout of that, not loving it at the moment), and cleaned out my main sponsor section. 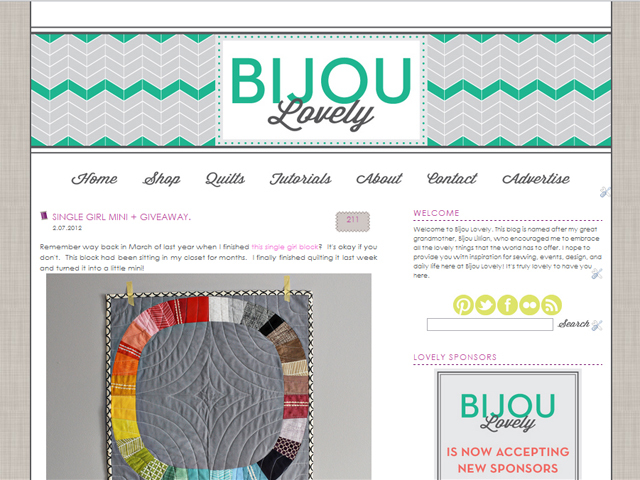 I've decided to take on some new sponsors, so if you're interested in advertising on Bijou Lovely, please check out this page. Further down I've added a new blog button, feel free to add it to your blog if you'd like! I also moved my blog list to the sidebar instead of including it on a separate page. So check there if you're looking for more sewing inspiration! Please let me know what you think of the change! If there's anything else you want me to improve on while I'm at it, let me know in the comments! Threaded comments would be nice...I'm looking into that as well. looks great!!... i'm digging the green! Looks great! Have you posted a list somewhere of your favorite fabric/supply shops? You always have the most gorgeous fabric in your tutorials, and I always wonder where you buy them. Jumped over here from Instagram. Love the look! ...well it's my first time to your blog and liked it right away!! The new look really attracted me at the start! I love it! The addition of the teal gave it just the right pop. I love it - you have such great a great visual style! I love it and your blog button is very cute. looking good! i like the chevrons & the green & grey.